Behr concrete stain is used to add color to concrete patios, walkways, driveways, interior concrete floors and garage floors. This page will describe how to use Behr cement stain and provide a form at the bottom of the page for people who have used Behr stain to submit reviews. 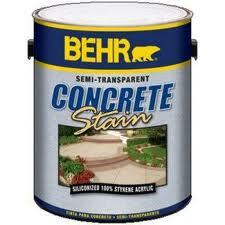 Behr stain for concrete comes in two types; Behr solid concrete stain and Behr semi-transparent concrete stain. I'll give you the guidelines below for how to prepare the concrete and how to apply Behr cement stain. One thing to make clear, Behr concrete stain is NOT a concrete acid stain, meaning it does not etch the concrete and chemically bond to the concrete surface. Both forms of Behr concrete stain are basically coatings on the concrete surface. The color or pigment in the stain is distributed into the pores of the concrete by a solvent called ethylene glycol. By not chemically bonding to the concrete surface, behr concrete stain and any other concrete coating may peel off if the concrete surface isn't prepared properly or if there is moisture in the concrete or the sub-grade, moving up through the concrete and evaporating out through the surface. This process of moisture moving up through the concrete and evaporating is called moisture vapor transmission (MVT). If your concrete has a high rate of MVT your newly applied Behr cement stain will start flaking and peeling in a very short period of time, especially in high foot traffic areas and under vehicle tires. An easy way to check if moisture is moving through your concrete is to tape down a 2 foot by 2 foot piece of plastic on the surface of the concrete. Tape all four edges very carefully with duct tape, let it sit for 24 hours then peel it off. If there is any moisture on the plastic or the concrete or if the concrete is darker, then you have moisture. An even better way to check for moisture vapor transmission is to do a calcium chloride test, this is a much more accurate way of testing for moisture and will give you the rate at which moisture is being emitted from the concrete. Chances are if you apply Behr concrete stain or any other topical coating to concrete with moisture vapor transmission, the stain will fail. If you want to add color to the concrete you would be better off using a concrete acid stain. 4. Test the concrete; sprinkle some water on the concrete if it is quickly absorbed the concrete is ready, if the water sits on the surface re-etch the surface again. 5. Apply Behr's concrete bonding primer to increase adhesion of the topcoat to the concrete surface. Do not thin Behr concrete stain, stir thoroughly before and during application. Only apply the stain if the temperature is between 50 and 90 degrees F. Do not apply in direct sunlight. Do not apply if rain is forecast in the next 24 hours. Only apply to dry concrete. Apply Behr stain in small concrete sections approximately 4’ by 4’ (1.2 m x 1.2 m). Work quickly and feather edges. Apply with a high quality pump sprayer at a fine spray setting using a circular motion. Immediately after spraying, back-roll with a 3/8” nap roller or pad applicator to achieve a more even appearance. Apply at a spread rate of 175-250 sq. ft. (16-23 m2) per gallon depending on the porosity and texture of the surface.Allow first coat to dry for 4 hours before deciding if a second coat is necessary. An additional coat will provide a darker and more uniform color. Apply second coat at a spread rate of 250-350 sq. ft. (23-32 m2) per gallon. Note: Horizontal surfaces may be subject to premature wear. Periodic touch-ups may be necessary. Dries to touch in 1 hour. Longer dry times are required in cooler temperatures and in higher humidity. Surfaces may be subjected to light foot traffic after 24 hours. Allow 72 hours before subjecting surface to heavy foot traffic, repositioning furniture or automotive traffic. Park vehicle tires on corrugated cardboard for 7 days after applying stain. After 30 days, clean as needed with a mild, non-abrasive liquid detergent. For added protection, use Behr wet-look sealer for a high-gloss finish or Behr low-lustre sealer for a low-gloss finish. Allow stain at least 4 hours to dry before topcoating. Follow all label instructions. Clean up with soap and water, properly dispose of all stained rags and protect any unused stain from freezing. Behr solid color concrete stain is a durable, water repellent, solid color stain designed to help protect and enhance both exterior and interior, vertical and horizontal concrete surfaces. This Siliconized Acrylic formula was created with high-performance, 100% acrylic resins, that form a strong long-lasting, opaque film on properly prepared concrete surfaces. Properly prepared Interior or Exterior surfaces such as: Concrete, Masonry Walls, Basements, Patios, Sidewalks, Driveways, Garage Floors, Tennis Courts, Cement Blocks, Pillars and Brick. Not for use on surfaces subject to hydrostatic pressure. Driveways and Garage Floors - Lack of proper surface preparation and/or over-application can lead to automobile tires lifting the product from the surface. New concrete must cure for a minimum of 30 days. For proper penetration and adhesion of topcoat, use BEHR CONCRETE & MASONRY CLEANER/ETCHER to clean and etch the surface. Remove mildew stains with BEHR PREMIUM MOLD & MILDEW STAIN REMOVER NO. Follow all label instructions. Apply BEHR CONCRETE & MASONRY BONDING PRIMER to increase adhesion of topcoat to the surface. Follow all label instructions. Option 1- To completely strip the entire surface, use BEHR CONCRETE & MASONRY PAINT STRIPPER. Follow all label instructions. Option 2- To recoat over an existing coating, remove any loose or peeling paint and scuff sand the surface. Use BEHR CONCRETE & MASONRY CLEANER/DEGREASER to clean previously coated surfaces in sound condition. Use BEHR CONCRETE & MASONRY CLEANER/ETCHER to clean and etch any bare concrete surface. Follow all label instructions. Spot prime all uncoated areas with BEHR CONCRETE & MASONRY BONDING PRIMER to increase adhesion of topcoat to the surface. Follow all label instructions. DO NOT THIN. Intermix all cans of same product to ensure color uniformity. Stir stain before and occasionally during application. Use product when air and surface temperatures are between 50-90°F (10-32°C). Apply a thin, even coat using a 1/4”-3/8” nap roller cover, pad applicator or a nylon/polyester brush at a spread rate of 400-600 sq. ft. (37-56 m2) per gallon. Use long, even strokes in one direction to avoid lap lines. Since concrete varies in texture/porosity, two coats may be required for uniform color appearance. Apply a second coat (in a criss-cross direction) if uniformity is needed. Recoat after 24 hours. Periodic touch-ups may be necessary. Allow 24 hours for light foot traffic. Allow 72 hours before subjecting surface to automotive tires, repositioning planters or furniture. Park vehicle tires on corrugated cardboard for 14 days after applying stain. After two weeks, dry stained surface may be cleaned with a mild, non-abrasive liquid detergent. Use soap and water.Properly dispose of all soiled rags and protect unused products from freezing. 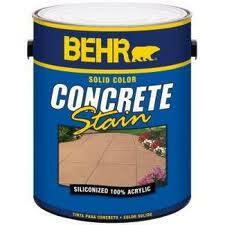 Behr concrete stain can be purchased at a Home Depot or Lowe's big box store. They will mix and add the color tint to the stain right at the stores.